I break an average of one thing a week. Sometimes it’s something glass that breaks while in a sink of soapy water with other dishes. I’ve broken glass vases while drying them. Sometimes I try to carry to many things and drop them, and something breaks. Soooooooooooo . 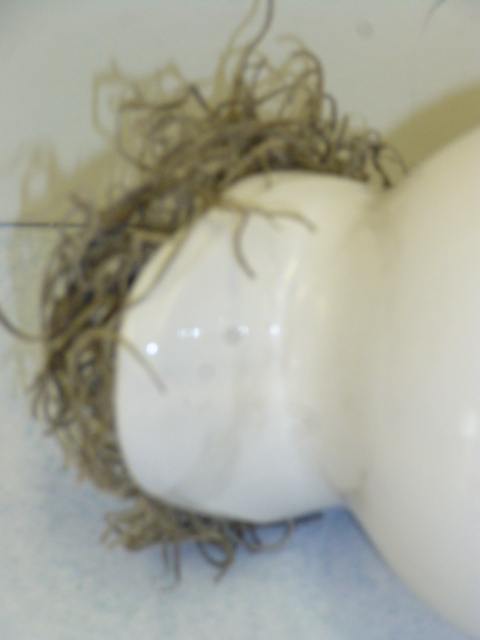 . . I’ve had to learn to ‘creatively’ deal with broken stuff. And SOMETIMES things are already damaged when I buy them and I don’t notice because I was too lazy to get my reading glasses out to inspect it more closely! 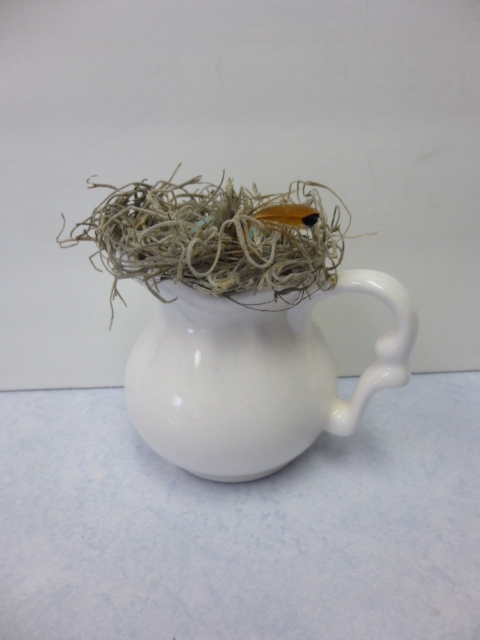 Thus was the case of this little white pitcher. 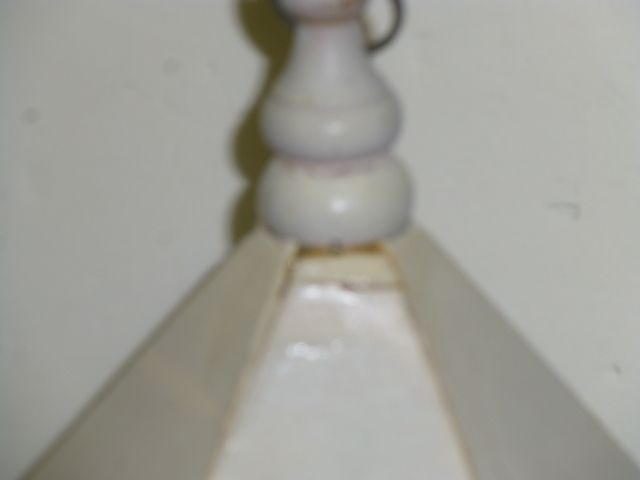 The spout part had been broken off and glued back on, so when I washed it, it fell off again. DRAT! I glued it back on but the break just ‘showed’ too much to sell ‘as is’. It sat for a good loooooooooooooooooong while before I figured out what to do with it. 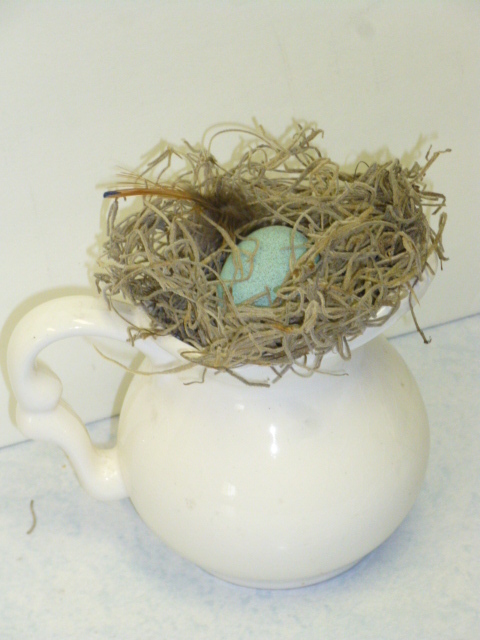 Fill it with a moss nest and add an egg! Perfect, no!?!? I actually LOVE buying things that have chips and cracks. 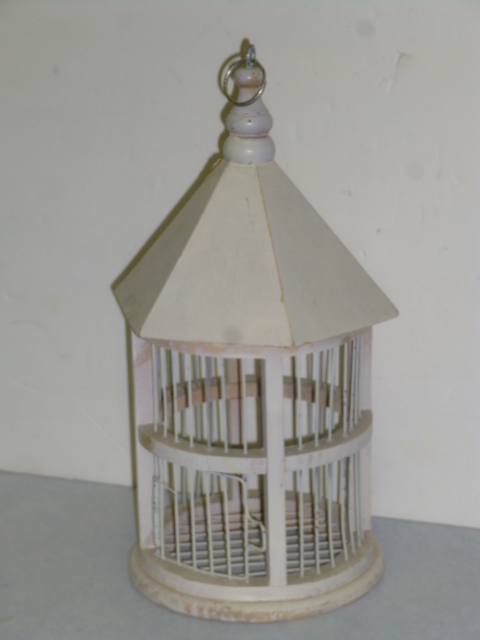 If you are going to sell items like this that have broken and been repaired, just be sure to note the crack on the price tag or in your listing if selling on line. No one likes to be surprised by stuff like that! 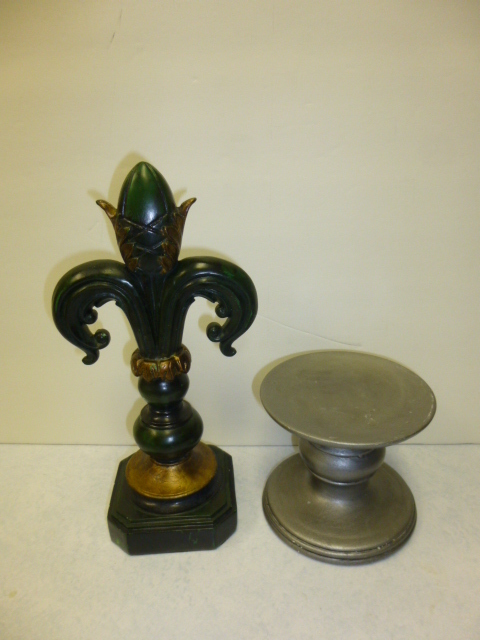 Just got this fleur de lis and pillar holder last week. 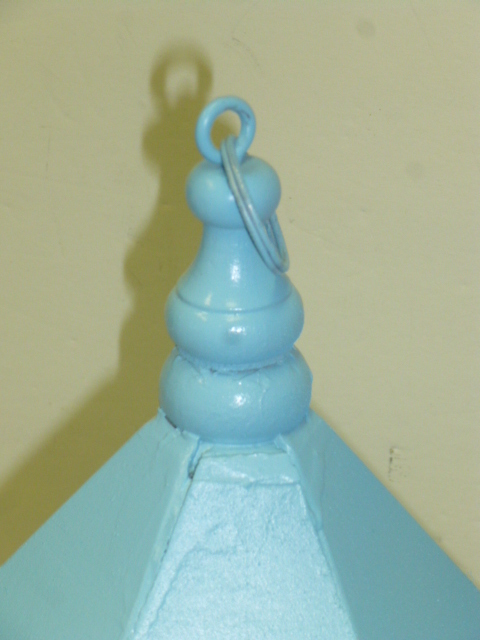 The pillar holder will eventually be a perch for a bird. 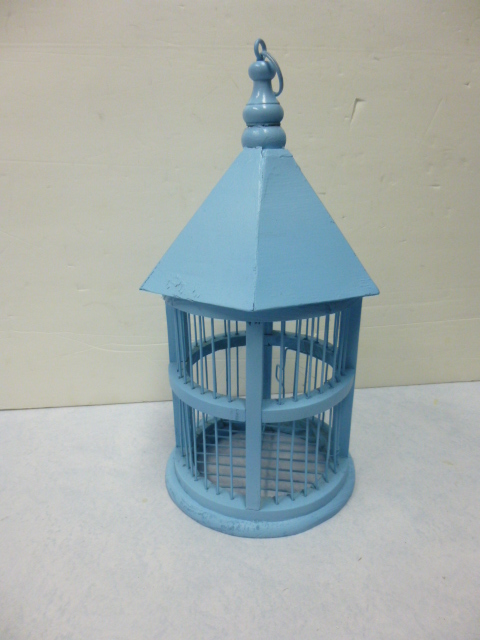 The fleur was getting a shabby chic make over. Had it outside to spray paint and Michael accidentally knocked it off the table and broke it into four pieces. He KNOWS to not toss it before asking me. This was DID have to be tossed though. Resin is hard to repair. 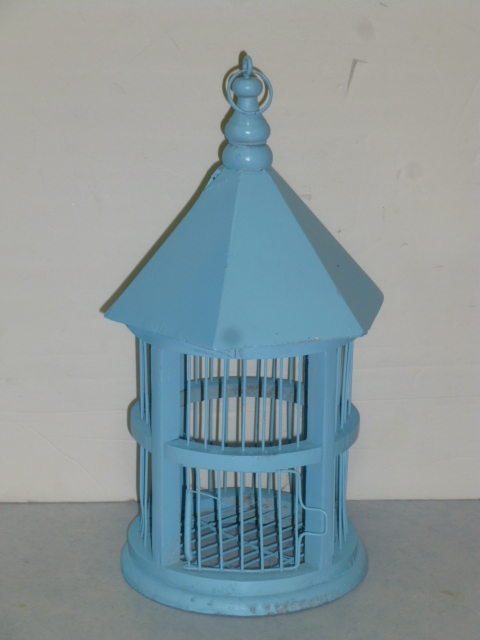 This sure little bird house DID say ‘as is’ on the thrift store price tag; but I figured I could easily fix it. A little piece had chipped off and was just ‘lying there’ and the roof have a couple of cracks near the broken part. I’ll tie a ribbon around that part and it will look perfect! And if you can’t flat out repair your broken stuff; save the parts for another project. I keep a box of spare parts. What’s your favorite ‘repair job’?